While the UFC’s most recent purchase hasn’t pleased everyone, several Strikeforce champions are thrilled to be under new ownership. Lightweight king Gilbert Melendez and freshly minted light heavyweight title holder Dan Henderson immediately expressed their feelings via Twitter, while heavyweight champ Alistair Overeem needed a couple of days for the initial shock to subside before dropping his two cents. While appearing as a guest on The MMA Hour, “The Demolition Man” said he was shocked the top secret deal went down, but was extremely excited about what the future holds for the sport of mixed martial arts. “I’m a positive guy. I see things through a positive lens. It can be really, really the best thing [that] ever happened to the sport, if it’s used positive, and I see that happening. If it’s used negative, then it’s going to be a downfall,” Overeem stated Monday. Coincidentally, the exact same time Overeem was getting interviewed by Ariel Helwani, the UFC and Strikeforce were hosting their first conference call as a team. Not much information has been revealed regarding the transaction, including during today’s call. Nonetheless, Overeem feels confident UFC president Dana White will continue to steer the ship in the right direction. 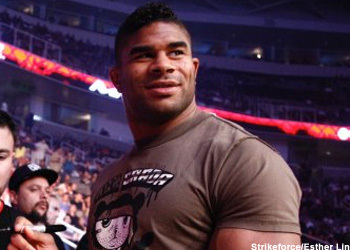 “The fans are going to get to see the fights that are most appealing to them,” Overeem stated. “I think this is what the sport needs to grow, because the sport has grown rapidly, but it’s still not there yet. It still needs to grow bigger. For now, Overeem is focused squarely on upset specialist Fabricio Werdum. The veterans meet in the quarterfinals of Strikeforce’s Heavyweight Grand Prix on June 18th.